I considered it a joy and a privilege to write the book Songs from the Heart: Meeting with God in the Psalms. It has been encouraging to see how God has used the book thus far to encourage people in their personal spiritual journeys. I recently received a letter from someone who had been encouraged and challenged by the chapter on Psalm 33 from my book. 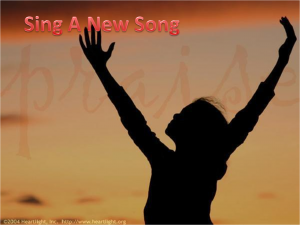 Psalm 33:3 states, “Sing to Him a new song; play skillfully with a shout of joy.” I challenged readers to consider singing a song to the Lord as an act of worship, though this song would be a “new song.” Basically, it was a challenge to just sing from your heart to God. I sought out the writer of the letter and asked for permission to share her thoughts on my blog, and I was granted permission. I decided to take your challenge of singing a new song to God. I am not a musical person. I can’t carry a tune, read music, or play an instrument. I sat on my patio and started singing a song to a tune I did not know and words that flowed perfectly, even as the tune changed. It was an amazing experience, and yet I cannot remember any of the words nor the tune. So thank you for your guidance. With your encouragement and the Holy Spirit’s help, I was able to meet my God in a way I never thought possible. God wants to meet with you too. You may have this encounter simply through reading the Bible, praying, or listening to worship songs. You might have a meaningful experience with God by singing a “new song” to the Lord that overflows from a heart filled with love and gratitude. Why not give it a try? God is longing to hear from you.